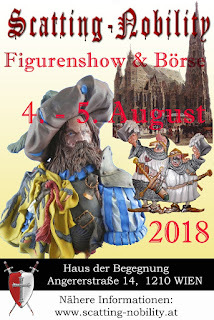 Scatting Nobility is a group of figure enthusiasts from Vienna who have been running their figure show bi-annually for quite a while now. The reputation of the show was to be seen by the number of international guests who attended from Italy, Croatia, the Netherlands, and a number of other countries. One of the big things this year was GW's sponsorship and the attendance of a handful of figure painters of international reknown who ran workshops throughout the two days, both thanks to my esteemed colleague Brownie having climbed on board with the organization of the event. Tim, the manager of GW Wien 1 store, had set up a paining area and did that thing GW do now - giving away boxes which contain either a pre-built Primaris Space Marine or a pre-built Stormcast. GW are doing well now, aren't they. Good stuff. It was the hottest time of the year, I was at a friend's wedding the night before - circumstances weren't perfect, but well enough. So I showed up at 7:30 in the morning for setting up the table. The chaps of Tabletopfreunde Wien-Umgebung helped me setting up. They were at the event to hold up the flag of wargamers. 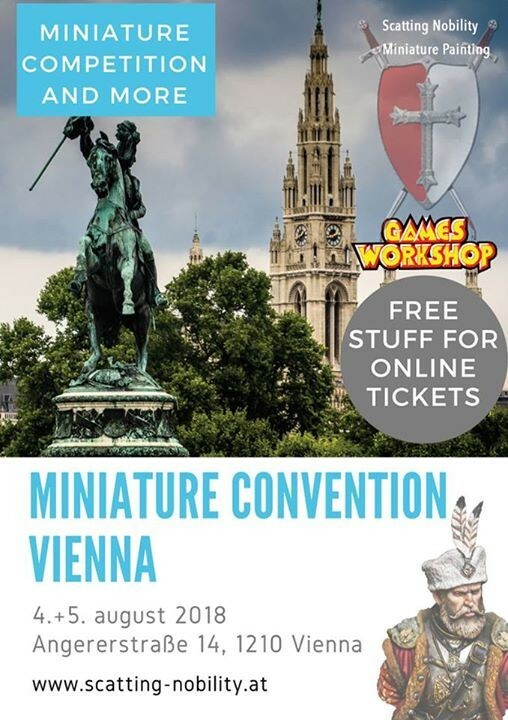 As we all know the wargamers sneak into any model/figure convention sooner or later. 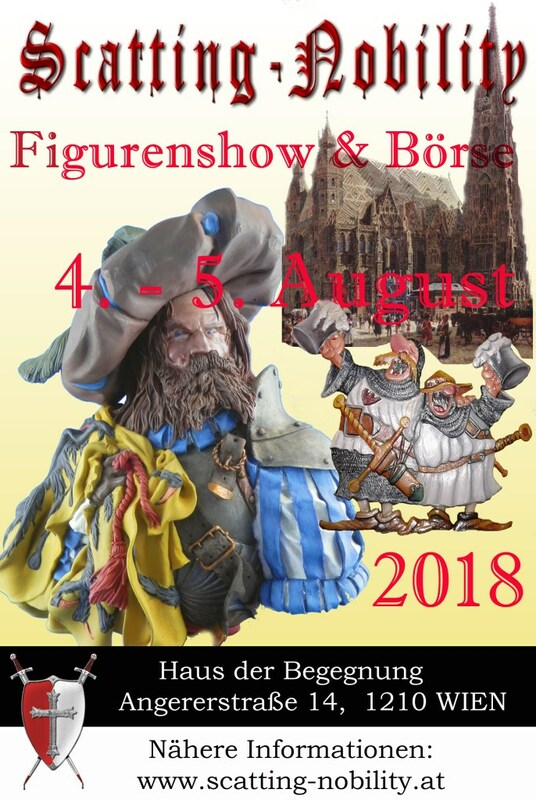 ;-) They brought their excellent new Vikings project (along with some nice WW2 and Age of Sigmar figures) and ran demo games of their rules set of choice - Steinhagel. I sat at the table next to them and did my thing. Which is chatting, painting, "getting the word out", ... that kind of stuff. ...and indeed some classics I hadn't shown for a while. And so did many other people from Austria and across Europe. I couldn't even begin to list them all, so I'll just share some impressions. Really cool stuff (mostly). I actually planned to buy one of these to paint up at home at the show but in the end forgot unfortunately. Well, next time, right? Dioramas in 1/72nd! Such pretty stuff. out one of the top hatches. Unfortunately the photos in most cases can't quite do the painting justice. Very, very interesting range there in the bottom. It's Tolkien-inspired mouse character figures. Here's another thing - these forced perspective dioramas with flat figures look amazing. Another unconventional piece based on the teacher Lämpel story from Max&Moritz. Is Max&Moritz a thing in the UK/US? Overall Miniature Convention Vienna was quite a nice experience, weather notwithstanding. The fact that it took place on possibly the hottest weekend of the year sure did not help attendance, but there was a good crowd of people who value lead over sunshine. :-D Good amount of families there as well, which is always nice. So yeah, good stuff. Thanks to the organizers, thanks to the chaps who helped me carry some of my stuff and indeed thanks to everybody who popped by for a chat! Next show I'll attend will be Vivat 5 in early November.